- 120km of pistes in Saint Sorlin d'Arves alone, with links to over 310km of pistes. - 514 snow cannons to keep the slopes in action across winter. - Picturesque mountain villages with rustic French charm. For those looking to escape on a ski adventure in a truly French resort, Saint Sorlin d'Arves is a good place to consider. The small traditional village, located at the bottom of Col de la Croix de Fer pass, makes up part of the larger ski area of Les Sybelles in the French Alps, and delivers a heart-warming and authentic atmosphere. Facing the breathtaking peaks of Les Aiguilles d'Arves, the area offers plenty of sunshine and exceptional snow conditions making it ideal for skiing, all snow sports and mountain activities, too. Saint Sorlin d'Arves offers access to over 310km of ski terrain in the Les Sybelles area, with around 120km of pistes in Saint Sorlin d'Arves alone. The wide open space makes the area particularly attractive to beginners and intermediate skiers, however there is a selection of challenging black runs for those who are more experienced. 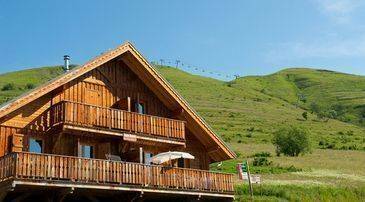 A great alternative to mainstream resorts, Saint Sorlin d'Arves is a cost effective option, well-suited to those on a budget. Party goers should not expect a happening scene, as nightlife tends to be low key. However on the plus side, this relatively quiet resort doesn't tend to attract many crowds, therefore queues for the lifts can be virtually non-existent! The season in Saint Sorlin d'Arves has a later start than many French resorts, commencing around mid-December and running through to mid-April. Altitude stands at 1600m, and the majority of the pistes are aimed at the intermediate skier, with 40% blue runs and 30% red runs. Beginner slopes are located near to the village stacking up at 20% of the overall skiable area, and there are limited black runs. In Saint Sorlin d'Arves there are 20 chair lifts giving access to 120km of ski terrain, and one blue cross country ski slope. The lifts open at 9am and close at 5pm. 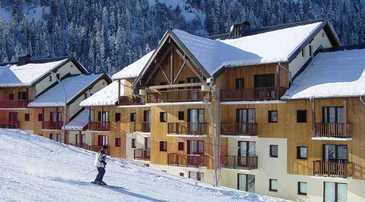 The wider area of Les Sybelles offers further ski opportunities and is actually the fourth largest ski area in France. The entire 310km area offers 20 green slopes, 40 blue slopes, 31 red slopes, and five black slopes, topped off with two snowparks. Of course, any ski resort is only as good as the snow that falls on it, but visitors to the Les Sybelles area can rest assured that they're well catered for. A total of 514 snow cannons ensure the area is well equipped to produce snow when necessary. This also guarantees that links between resorts have good snow cover, enabling ski in ski out versatility. The slopes are continually well groomed which is a big plus for the intermediate and beginner skiers. For those who just cannot get enough of skiing, two resorts in the area actually offer a night ski option. La Toussuire has skiing under the floodlights on an easy slope, ideal for beginners really wanting to put the practice in. La Chal in Saint Jean d'Arvesalso offers a night ski option, but both resorts limit the operating times so it is advisable to check in advance. Black runs in this area are limited, but this does actually have its advantages. More experienced skiers tend to head elsewhere, looking for more numerous black runs and extensive challenging terrain. Therefore the difficult runs in Les Sybelles tend to be rather quiet. Head for the short, fierce mogul run named P.Ramuz or the longer J.N Augert, both of which are equally challenging. 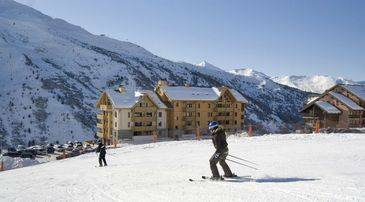 For intermediate skiers looking for a quiet place to practice, the blue Vallons run situated at the back of the resort offers a 3km run, far away from the hustle and bustle of the lifts and busier slopes. St Sorlin d'Arves is a picturesque mountain village with a certain French charm. While skiing is at the heart of the area, there are other activities available. Culture vultures will be inspired by the Museum of Yesteryear. The museum offers a journey through time, where you can discover the lifestyle of the area in bygone generations. Visit St Saturnin, a beautiful baroque church which dates back to 1603. And for those prone to cabin fever, a trip to the markets in the beautiful town of Turin may be in order. With such a large ski area to enjoy, many of the activities in St Sorlin d'Arves are naturally snow based! This includes sled dog rides, snowshoeing, hand skiing and snow biking. Have you heard of skwalling? Another snow based activity similar to snowboarding in that your two legs are attached to the same plate or board, but your feet both face forwards. Killer on the thighs, this sport provides the thrill of boarding, with the skill of both feet facing forwards. Those who still have the energy might enjoy an outdoor game of laser tag or take to the skies, paragliding over the stunning Les Sybelles ski zone. If you want to ensure you are looking good on the hill, you will be pleased to know the resort has a hairdresser and wellness centre. Tendance Nordique offers the unique experience of sinking into a hot tub of water heated to 39 degrees celsius outdoors. This is a great way to unwind after skiing, and for total relaxation we recommend adding in a massage! This is a low key resort and you won't find bar after bar with nightclubs open to the small hours. Despite this, there is a good choice of restaurants to choose from, both on the mountain and in the villages. Those looking for traditional cuisine in a cosy setting should head for L'Abate. Alternatively, opt for something a little more upscale at Le Cerf Aux Bois D'Argent, known for its gourmet reputation. There is one nightclub in the area named D'Sybell and this opens from Monday through to Saturday. La Grotte du Yeti is pub / bar offering live music and live sport. Away from the bars and restaurant the resort is also home to a small cinema and a bar with a bowling alley. In this area lift passes come in all shapes and sizes to suit all levels of experience and various durations. There are two main types of lift passes, a local area pass gives you access only to the Saint Sorlin d'Arves pistes, whereas the full area pass gives you access to the entire Sybelles ski area. Madame Vacances clients benefit from an exclusive 5% discount on Sybelles so be sure to book with your accommodation. Book your Most of the shops have an online rental service which does save money when compared to hiring in resort. The ski school in the area is called the ESF de Saint Sorlin d'Arves. The school offers a well-rounded service for children of three and a half years to adults. Booking can be made online and is advisable to avoid disappointment. To ensure your peace of mind on the slopes, childcare is well-catered for in this resort. The Nursery Les Petits Diables looks after children aged between three months and four years old. Older children can entertained in the Portes Ouvertes or the recreation centre. Once again, spaces are limited so advanced booking is advised. Most of the accommodation in the area does offer parking. There are additional car parks in the area located near the town hall and tourist office.